A team of researchers and their highly specialized greenhouse are changing the way we use crop protection. Frankfurt is a long way from the highlands of Guatemala. For Javier Campos, the journey took six years. Back in 2010, the young Spaniard was working for the United Nations Development Program, helping local subsistence farmers in one of the most mountainous countries of Central America improve their harvests. He had just finished his studies in agronomy at a Danish university and was eager to put his knowledge to use. »Our aim in Guatemala was to show how terraced fields could decrease both erosion and surface runoff«, he explains. »Local farmers had been struggling for centuries with rain quite literally washing away the fruits of their labor.« In a broader sense, six years, further studies in Spain and a few stints at bioresearch companies later, he is now working on his Ph.D. to deal with a similar issue. Only this time, he controls the weather. At the Clariant Innovation Center in Frankfurt-Höchst, Campos and his colleague Peter Mansour are putting the final touches on a very special greenhouse. They prefer the term ›phytotron‹. It’s an enclosed research greenhouse that allows them to control almost every aspect of a plant’s life. »We control the soil, the temperature as well as the amount of rain, wind, light, and humidity the plant is exposed to«, says Mansour. The chemical lab technician has spent his whole career optimizing crop protection and fertilizers. 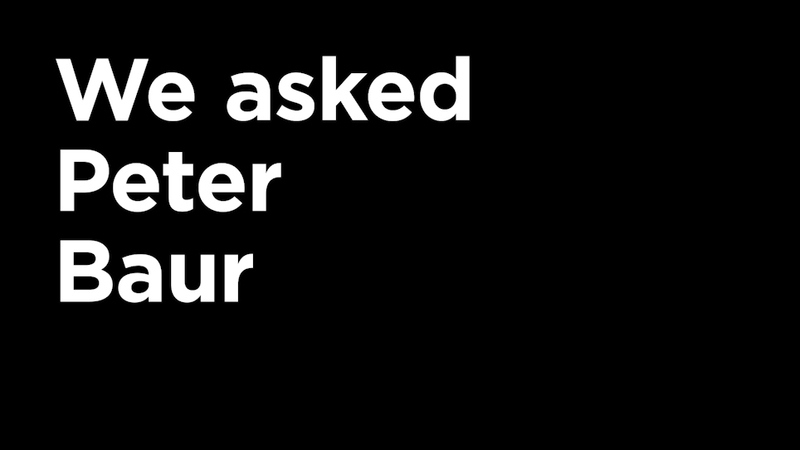 Clariant produces neither. But the company is a global player in additives and adjuvants — chemicals that make herbicides, pesticides, fungicides and fertilizers more effective. These are what Mansour and Campos will be testing, but they’re already adding new tricks to Clariant’s toolbox. The total size of the new greenhouse in the Clariant Innovation Center (CIC) in Frankfurt-Höchst is 400 sqm. The greenhouse itself is divided into three sections which broadly represent three principal areas of research: bioherbicides, foliar fertilizers, and plant growth regulators, or PGRs. »None of these are themselves entirely new. 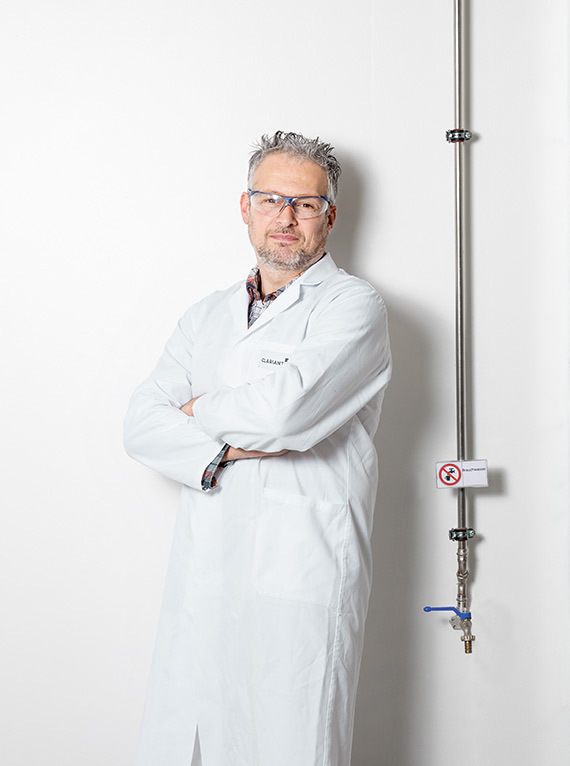 But the way we aim to combine them, and our approach in experimenting with these combinations are pretty unheard of in the industry«, says Prof. Peter Baur. He is the head of Clariant’s Competence Center for Crop Solutions and Global Application Development. Baur joined the company in 2011. 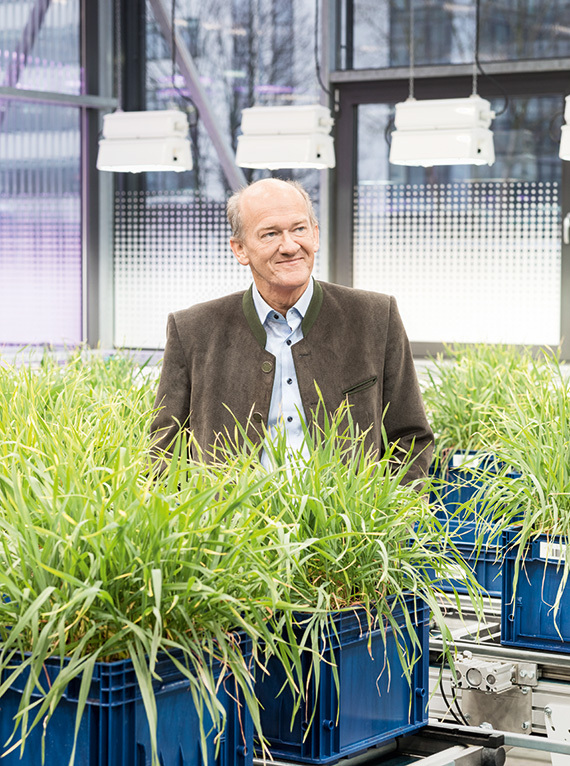 He has worked in crop science for decades and still teaches phytobiology at the Leibniz University of Hannover. He’s a busy man. And talking to him about his work is like trying to take a sip from a firehose. Baur quickly delves deep into biochemical mechanisms just to then draw macroeconomic conclusions about how a sturdier stem in rice, for example, could translate to higher yields, which in turn could help deal with hunger, growing populations, and climate change. All the while his phone rings and lab researchers pop their heads in the door hoping to get his take on their latest data. The global market in agricultural chemicals is worth well over USD 200 billion today and is by some estimates projected to grow beyond USD 300 billion within a decade. Clariant is an important supplier to the industry. But its operations are tiny compared to some of the global agrochemical giants. 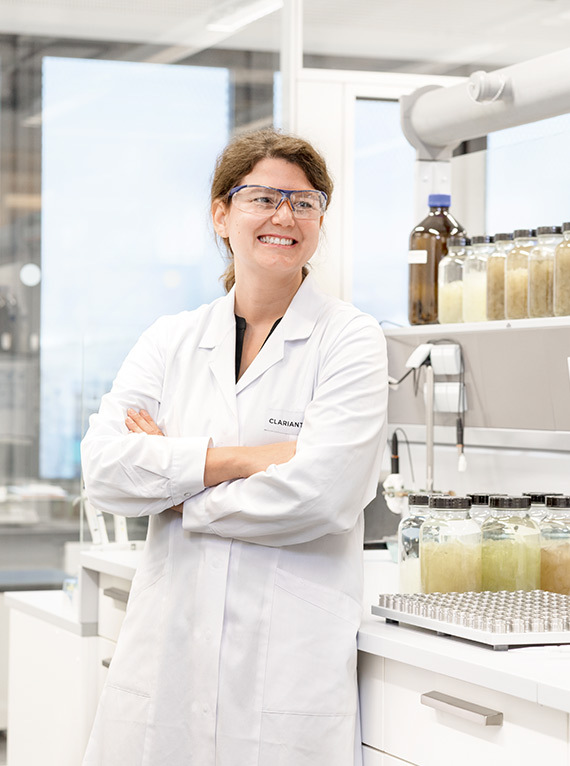 The fact that Clariant hired a renowned plant specialist like Baur and is now researching crop solutions at such a fundamental level is remarkable in itself. Clariant produces mostly additives that help formulate crop protection products and fertilizers. Some simply help emulsify or disperse the active ingredients in a liquid formulation. Others make them stick to the plant so they’re not blown or washed away. The list goes on quite a bit, but Baur wants to do more. »I know that we can add more value and develop sustainable solutions to feed more people«, he says. Baur sees nothing less than another green revolution akin to those of the beginning and middle of the last century, which helped feed an ever-growing population. »This time we could do it while also addressing climate change«, he says. He hopes to contribute by focusing on areas of crop protection that – in his mind – have been neglected so far. To replicate fog and conditions of high humidity, 120 high-pressure fog nozzles have been installed in the greenhouse. Bioherbicides are another field of interest. They’re also a growing market. »These are substances also found in nature that can target specific weeds but have so far not been used to their full potential«, says Baur. Clariant tests tailored combinations of various bioherbicides together with adjuvants that improve their effect. A section of the greenhouse in Frankfurt is filled with rows of weeds wilting away to different degrees. »We work out the optimal combination that effectively combats a whole number of problematic weeds while leaving the crops healthy«, says Peter Mansour, pointing out rows in which several different weeds have evidently been hit hardest. Invasive new weeds and acquired resistances can make crop protection become an arms race, but as Prof. Baur explains, bioherbicides are harder for weeds to avoid: »Some of these natural chemicals are vital to a weed’s metabolism. So there’s no real way for it around them.« Plus, as nonsynthetic natural alternatives, bioherbicides are welcomed by a public that is more and more concerned about the chemicals used in agriculture. Foliar fertilizers are the third area of research Baur hopes to drive forward. These are fertilizers that are absorbed not by the roots but rather through the leaves. This may yet turn out to be the most important research because it could provide new ways of getting fertilizers, bioherbicides and growth regulators into the plants a lot more efficiently. 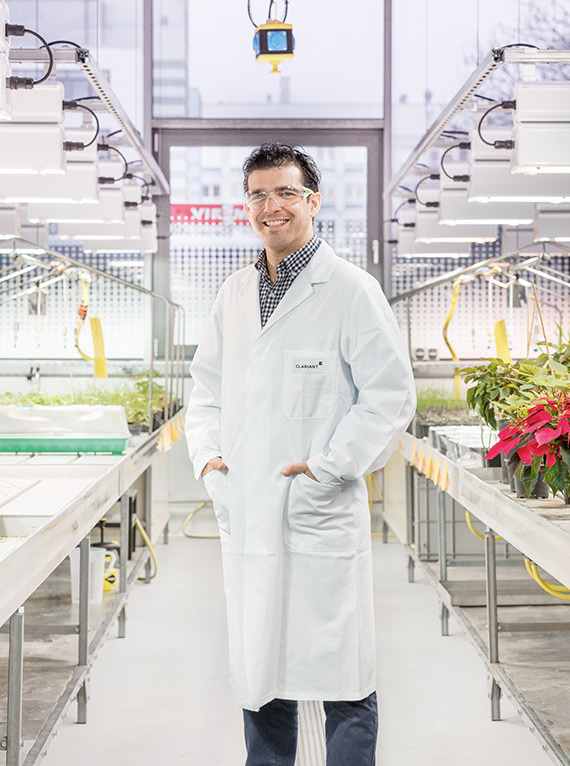 »We can already feed a plant certain micronutrients directly through its leaves«, says Baur. »Imagine a plant lacking in manganese, for example, an element that plays an important role in photosynthesis. If we introduce this nutrient to the soil, most of it forms complex bonds there and becomes unavailable to the plant. Feeding manganese straight into the leaves avoids this. So we can give the plant exactly what it needs without much waste.« Baur foresees a future in which plants are fed even more complex molecules such as vitamins, amino acids, and proteins. That, he hopes, might usher in a green revolution of crops with completely new nutritional value. Think of common cereals becoming new super foods that could tackle any number of deficiencies or malnutrition in populations that rely on one staple crop. »All this without ever meddling with genetically modified organisms«, as Baur explains. 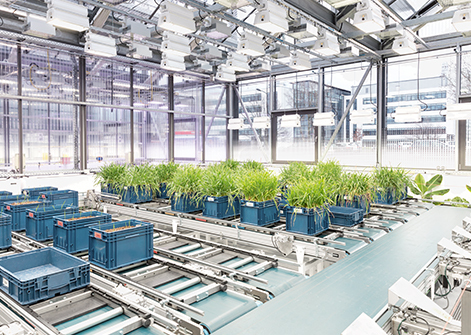 A robotic arm and a system of conveyor belts take the plants through an automated routine within the greenhouse. Understanding how to get anything first onto and then into the leaves effectively is something that Baur’s team has been working on for a few years now. While foliar fertilizers are also tested in the greenhouse, the necessary lab work is mostly done in the much larger building towering right next door. The Clariant Innovation Center or CIC is the company’s flagship in research and development. It was opened in 2013 in one of Germany’s largest industrial parks on the outskirts of Frankfurt. A total of 500 people work here in research and development for all Business Units under Clariant’s roof. Walking through a vast atrium, visitors notice a constant hum and whisper. On every floor, bright young minds are gathered around coffee makers, sofas or whiteboards, discussing ideas, lab results and probably plans for the weekend. Corridors of highly specialized labs lead away on every floor. One of those corridors on the third floor as well as the roughly 20 researchers inside are dedicated to crop solutions. The work here isn’t always very glamorous or even exciting. 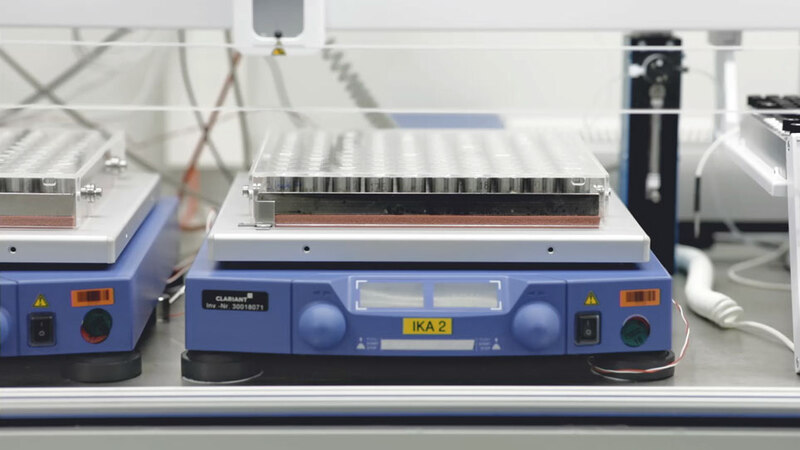 Whenever they’re not generating or analyzing data, the lab researchers punch out thousands of coin-sized disks from leaves. These are then partially dissolved to isolate the top protective layer, the cuticle, before being individually set out by hand to dry. »Whatever we want to get into the leaf has to permeate the cuticle«, explains Stephanie Giessler, one of the leading researchers here. »So we test arrays of hundreds of these at a time, and we have to check every disk for holes as well. Any tiny scratch or even a bite mark from an aphid could mess up the results.« Thankfully, quantifying how much of the desired substance went through each disk and how fast is an automated process developed by Clariant. The total area of the Clariant Innovation Center is 36 000 sqm, more than a third of which is taken up by laboratories. Two doors down, the equipment is decidedly more sophisticated. An electron microscope coupled with something called energy-dispersive X-ray spectroscopy shows in mind-boggling detail how and where individual particles of certain minerals have settled onto plant cells. »This shows us for example whether a nutrient we’ve sprayed has spread evenly or whether it accumulated in certain areas«, Giessler explains showing an image of the so-called coffee-ring effect. »Without our surfactants, most solutions would form these rings at the edge of any dried up droplet.« Another test uses 14C, a special radioactive carbon isotope, to label specific fertilizer molecules and show how they’ve moved through the plant and where they’ve reached. In a hermetically sealed chamber further along, Giessler and her colleagues even test how the speed of the tractor spraying the fertilizer and the type of nozzle used may affect the application. High speed cameras show how individual droplets either bounce off or adhere to the plant. All in the name of making future crop solutions more efficient. »It’s what we’ve set out to do«, says Baur. »Whereas much of the agrochemical industry still follows what I like to call ‘spray and pray’, we here at Clariant want to figure out precisely what works and how in order to tweak our solutions and come up with brand new ones.« He strives to emulate companies like Bosch, a German engineering firm and the world’s largest supplier of automotive components. »From spark plugs to traction control systems, it’s mostly their innovations that allow car companies to continuously improve safety, efficiency and ease of use«, he says. »Similarly, we want to be the number one driving force behind innovation in the agrochemical industry.« That’s ambitious. But if he succeeds, today’s work by the likes of Javier Campos might soon help farmers improve their harvests and indeed feed a growing population all over the world.